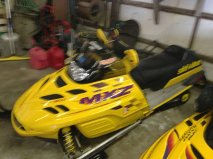 1999 Skidoo MXZ 600 with 3952 miles. It has sportech hand guards, 2 year old ripsaw 1.25 inch track, 2 new boggie wheels on left side, brand new Woodys carbides. In good condition, no rips or tears on the upholstery. Great running sled, only selling to upgrade to a newer model. Asking 1500 OBO.